I saw these adorable flats in a recent issue of Marie Claire and knew they had to be mine. All of my favorite neutral colors? Love. Casual but sophisticated? Perfect. Cute pointy toe? Check. And here's the big surprise- guess where they're from? Payless! No joke. 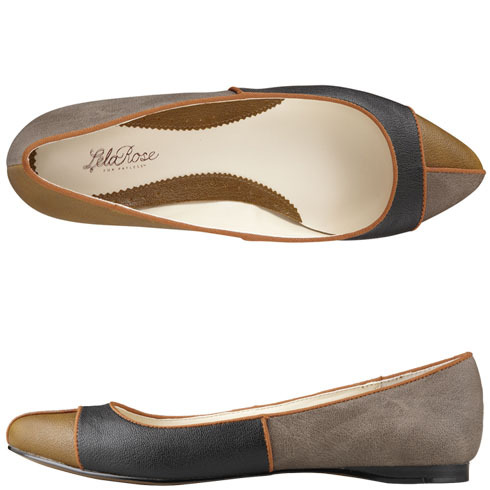 And these sweet little colorblock flats are even on sale right now for a cheapola $24.99. Can't beat it, right? Just a warning- I'd order at least a half size smaller than you'd normally wear. I had to return my first pair because they were too big. Also, there are not many sizes available on the website, but check your local stores too! So cute! I need more good flats. Love these! I found a great deal on a Barbour Coat -- 30% off! I also got a rifle paper co calendar for 30% - love these after holiday sales. Yeah, I think I need these. I found a couple of really nice pointy-toed flats from Real Simple, but they were not that cheap. And wearing them to work every day really wears them out. I used to be a heels girl, but I've recently sworn off them. And it's a challenge to find flats that are dressy enough for business dress. Thanks for the tip! wow, I wouldn't have expected payless- they're really great. casual, but still very sophisticated. Oh, those are super cute. Thanks for the size tip. Happy Friday. Promise to catch up soon. Crazy week. These are super cute!! Sophisticated and chic! Those are so stylish - love them! They are super cute! And, what a steal!! Thanks for the sizing tip. Payless??? Shut your pretty little mouth. I am shocked and off to find a pair for yours truly! Have a good weekend girl! Wow Payless - really??? They're so cute! Those are so cute!! I've actually found a few really cute shoes at Payless in the last year or two so I may have to venture off their. Right. Now. Just stumbled upon your cute blog! I love those shoes. I used to read through magazines quickly, not really paying too much attention to the product pages or ads, but now I find myself often seeing something I love and then hunting it down. What's even better is when you find that they are super affordable! Happy Sunday. Those are super cute, and would have never guessed they are from Payless! I need to go track those down! these are super cute! i so wanted to visit lela rose's boutique when in I was in NYC a few years back..so bummed I didn't get the chance!